Heads of agencies often ask me if I can help their people be more commercially savvy, unafraid to talk about money and simply more able to say ‘no’ to clients. Yes I can, but it will probably involve them in some hard, possibly brave, decisions. Being a pussycat is a problem. If you’re soft and want to always say ‘yes’ & please your client the whole time then running a profitable business will be hard. It seems counter-intuitive but the more easily you say ‘yes’ to your clients the more you’ll regret it. Warren Buffet was asked what the difference is between successful people and really successful people. His reply was that the really successful people hardly ever say ‘yes’. 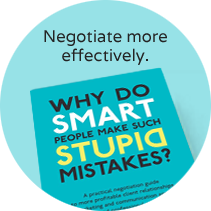 Saying ‘yes’ too often and too easily can get you into trouble financially and relationship-wise with clients. Agreeing to an unrealistic budget, agreeing to a deadline that’s crazily tight or accepting a poorly thought through brief will cause you problems in the short term and set precedents in the long term. I read about another agency that has gone bust. (Not one of my clients but one I spoke to last year) They didn’t want to change. They didn’t want to be brave and certainly didn’t want to ‘rock the boat’. They wanted to be left alone, ie, ‘Do not disturb’. They wanted to do what they’d always done, whether that was right or wrong. It was just what they knew and felt comfortable with.